Fast speeds to capture HD videoKingston's SDHC/SDxC Class 10 UHS-I card is designed to be fast, with reduced buffer time between shots, making it ideal for cinema-quality full HD video and 3D video.1 It's available in multiple capacities up to 128GB, to provide plenty of space for HD videos and hi-res photos, and it's tested to be durable, so you can take it anywhere with confidence that your photos, videos and other data will be protected, even in harsh or unstable conditions.FEATURESSPECIFICATIONSCapacities :16GB, 32GB, 64GB, 128GBmicroSDHC/SDXC card :24mm x 32mm x 2. We are not associated with any printer and /or original printing supplies manufactured. Storage Capacity: 32 GB. Manufacturer Part Number: SDS/32GB. Storage Capacity: 32 GB. 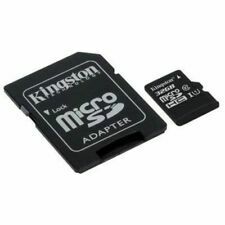 Manufacturer Part Number: SDS/32GB. We are not associated with any printer and /or original printing supplies manufactured. Storage Capacity: 32 GB. Product Line: Canvas Select. 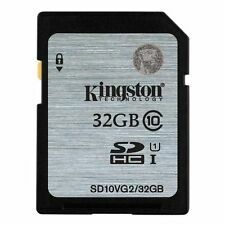 Manufacturer Part Number: SDS/32GB. We are not associated with any printer and /or original printing supplies manufactured. It's available in multiple capacities up to 128GB, to provide plenty of space to capture an entire trip. 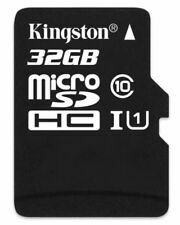 Kingston (32GB) SD Card UHS-1 Class 10. FC 32GB CL10 UHS1 SD. Product Family Canvas Select. Form Factor SD Card. Storage Capacity: 32 GB. Maximum Read Speed: 80 MB/s. Maximum Write Speed: 10 MB/s. Product Line: Canvas Select. Manufacturer Part Number: SDS/32GB. We are not associated with any printer and /or original printing supplies manufactured. Storage Capacity: 32 GB. Maximum Read Speed: 80 MB/s. Width: 24 mm. Manufacturer Part Number: SDS/32GB. Maximum Write Speed: 10 MB/s. We are not associated with any printer and /or original printing supplies manufactured. Storage Capacity: 32 GB. Maximum Write Speed: 10 MB/s. Manufacturer Part Number: SDS/32GB. We are not associated with any printer and /or original printing supplies manufactured. 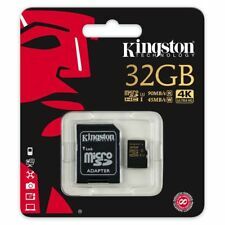 32GB microSD High Capacity (microSDHC) Card microSDHC 32 GB. Product Type: microSDHC. Manufacturer: Kingston. Storage Capacity: 32 GB. Maximum Write Speed: 10 MB/s. Maximum Read Speed: 45 MB/s. We may no longer be able to change or cancel your order. Compatible with microSDHC and Micro SDXC host devices. Rugged: tested to be waterproof , shock and vibration proof , x-ray proof , and temperature proof . 32GB microSDHC CL10 UHS-I Card SD Adapter.